This article was originally posted on Level Up Translation's blog. Brazil is the 5th largest population in the world with more than 66 million gamers – almost as many people as the entire UK population. The country’s strong economic drive is fueling a drastic uptake in the number of gamers who are willing to spend money on their favorite platforms. This rise to gaming maturity hasn’t gone unnoticed for key actors of the industry such as Sony, Ubisoft or Activision and big things are going to happen over the next couple of years. 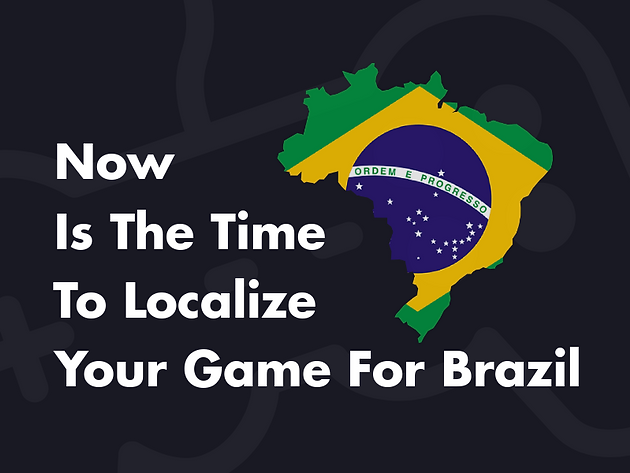 In this article we’re looking at why now is the time to localize your game for Brazil. 2 - What do Brazilian gamers want from localization? In 2017, Brazil became the world’s 13th biggest gaming market, overtaking Australia. Brazil’s status as an emerging economy means there’s plenty of more growth to come, too. Look at the table above and every gaming market worth more than Brazil right now is a developed economy with less room for growth. Brazil’s huge population and rapid development leave plenty of room for growth beyond its existing 66 million gamers – and this is why industry giants like Sony and Ubisoft are so excited about the country’s prospects. One of the most interesting features of Brazil’s gaming market is that more women in the country play games than men – something to keep in mind as we look at the most popular types of games in Brazil. As you can see from the graphic above, the most popular game genre in Brazil is strategy. However, there’s variation between the two genders. Action is the most popular genre among male gamers while racing comes second and strategy third. However, racing drops down to fifth for female gamers in Brazil and there’s no showing for sports in the top five genres for females. Another key feature of the market in Brazil is the platforms people choose to play their games on. Mobile has only recently overtaken PC and console gaming, leaving a similar market share between the three platform choices. Smartphone gaming is expected to continue its growth over the coming years so this gap will increase with time, but not as drastically as you might think. Android still dominates the mobile OS war in Brazil with more than 83% of smartphone users owning an Android device (Statista, 2017). So Android gives the furthest reach by far, but iOS users typically spend more on in-app purchases. Interestingly, a large portion of Brazil’s console gamers are still playing on previous generation consoles – partly due to the cost of the latest devices. However, Brazil’s economic rise is powering a second rush for console gaming as more people can afford the latest generation devices. Aside from Brazil having the world’s 5th largest population, Brazilian gamers make up the fourth largest population on Steam. According to Statista, with an expected growth rate of 6.0%, Brazil’s mobile gaming market should be worth US$387m by 2020. "Brazil’s game industry is growing. According to App Annie, when it comes to downloads, Brazil is the largest BRIC country for Google Play; only the United States download more. The English proficiency is however relatively low in Brazil. Only 11 % communicate in English. As access to the internet grows, many children and young adults play video games. A large market, increasing incomes, and a growing technical infrastructure will give a translation into Brazilian Portuguese a potentially high return on investment." DID YOU KNOW IT? - The 2nd biggest video game convention in the world after Gamescom is the Brasil Game Show which drew more than 300,000 people in 2017. If you’re wondering how important it is to Brazilian gamers to have games in their native language, localization is actually the 4th most important criteria for people who buy games in the country. High English level - A : not particularly concerned with localization, routinely playing games in English only. High English level - B: care about localization but generally prefer to play in English, mainly due to poor quality in localization and dubbing. Despite a high level of English, these gamers often experience poor localization problems in multiplayer scenarios with gamers of lower proficiency. Good English level: prefer Brazilian for a better and more relaxed immersion in the game and firmly believe it improves the gaming experience. Poor English level: the majority of Brazilian gamers who rely on quality localization to fully understand the game and enjoy the true experience. They may be capable of completing a game with basic translation, but won’t be able to engage with the storyline or the wider experience you’ve worked hard to create. This is an oversimplified summary of Brazil’s gaming population but it gives you an idea of some of the roles your localization strategy needs to play. Importantly, it’s the majority of gamers who rely on localization to enjoy the best of titles but most of them are used to wanting more from major releases. According to the gamers we spoke to, few are satisfied with the localization and dubbing of games for Brazilian audiences. This shows how far short of expectations the majority of publishers are falling - with a few exceptions, such as The Last of Us, The Witcher 3, and some titles from Ubisoft and Blizzard. Quality localization is massively desired, but poor localization has Brazilian gamers switching back to English and the “original” experience if voiceovers, translations or synchronizations interfere with the flow of the game. For more insights on how Brazil’s diverse gaming population reacts to localization, we reached out to them on Reddit and IGN to get their feedback. Here’s what we found out. 1 - How important to you is it that games are localized for Brazilian players? The group with a high English level showed the most indifference. There were others with also a high/good level of English, who thought it was important to have it localized in Brazilian Portuguese for the public which lack of command in this language, for the game experience and immersion sake. And most important, many of them said the game experience would be much more relaxed and easygoing, that it’d would help them give more attention to other aspects of the game they consider as important as understanding it. Many gamers appreciate when a company launches a game with a good localization into Brazilian Portuguese, it’s regarded as a sign of consideration towards the Brazilian gamers community, like, the studio actually thought of them. "It’s very important, not so much for understanding it, but having a game localized in your own language gives you a different feeling somehow towards the game producer. 2 - What’s it like playing games that aren’t localized? Once again, gamers with high English proficiency show the greatest indifference to this question. However, it was unanimous that all the titles from all platforms should always give the gamer the option between choosing to play in English or Brazilian Portuguese. 3 - How does poor localization affect your experience? It’s unanimous: bad localization ruins the experience. Basically anything that would break the immersion would make most of the gamers switch back into English immediately. That is, literal translations, lack of context and connection with the Brazilian culture, nonsense sentences, lack of synchronization, grammar mistakes, poor language or amateur dubbers. The market is craving for a good localization service, especially in what concerns dubbing. "It depends, but in general it interferes in the game experience, honestly. A poorly translated game can prevent you from advancing in the plot, confuse you, etc. There’s nothing worse than being taken out of the fantasy due to poor translation, a nonsense sentence or a misplaced word. Even worse when you come across Google Translate material, which is literally translated. It makes me sick when I see such things. 4 - What is it like playing games that are localized for European Portuguese (ptPT) rather than Brazilian Portuguese (ptBR)? Despite a couple of gamers being happy with the idea of playing in ptPT, the vast majority reject ptPT localization altogether. The lesson is this: localize for ptBR or don’t bother localizing for Brazilians at all. 5 - How likely are you to buy a game that isn’t localized for Brazilians? The majority says it is not a decisive factor and they’d buy the game anyway. There’s another group who says it depends very much on the game in question. And a minority stated they would boycott it, or buy those titles only in major sales. Aside from getting a good translation for your game, you also need to think about the more technical and strategic aspects of localizing for Brazilian Portuguese. Sentences in Brazilian Portuguese can be up to 25% longer than their English equivalent. This means you need to think about text expansion, which could break the layout or design element in your user interfaces. Likewise, text dialogue and subtitles will be longer, making it more difficult for users to read dialogue – particularly if you don’t give them enough time to finish reading. This can make conversations between characters tricky. If users can’t read your text before another character starts speaking, you have a serious problem. The same thing applies to voiceover translations as the length of spoken sentences also increases. The first thing you need to do with localizing for accented characters is use the right character set in your code. If you’re building your game for mobile or web, stick to UTF-8 encoding, which covers you for all languages, including any special characters they come with. Next, you need to think about your font choices. Just because your favourite font supports English, it doesn’t necessarily come with the special characters you need for Brazilian Portuguese or other languages. So you might need to rethink your font choices, which can even go on to affect the design of your game. A Study by Opinion Box in 2015 found that 39.5% of mobile gamers in Brazil make in-app purchases. This figure is much higher than the 15.3% of users who paid for apps outright. Bear in mind, these stats come from a market that is experiencing rapid growth and isn’t yet properly catered for by game developers localizing for Brazilian gamers. So, when thinking of your pricing strategy, keep in mind that most profitable apps in Brazil are freemium games which offer consumable items through in-app purchases. In 2015, Hong Kong-based developer Animoca localized its Star Girl series of games for five emerging markets with the goal of increasing monetization. This included Brazil, alongside Malaysia, the Philippines, Russia and Thailand, which the developer pinpointed as markets where the series could perform better. As part of the localization strategy, Animoca created a more flexible minimum pricing policy in order to attract gamers at a lower price point. The results were impressive: a 3.5x increase in transactions within the first three months. Also, 90% of these transactions were from new buyers, half of which followed up with additional purchases. Crucial to localizing any game for the Brazilian market is catering for the most popular payment gateways in the country. Don’t just stick a PayPal button on there and hope for the best. MercadoPago and PagSeguro are among the other popular payment gateways in the country that you might want to support. Steam (where Brazilian gamers are the 4th biggest population), GOG,Green Man Gaming (both fully localized in Brazilian Portuguese) and obviously Google Play are your best chances for your game to meet its Brazilian Portuguese audience. On the other hand, Humble Store, Gamers Gate, Get Games, Robot Cache are not localized for Brazil. Brazil’s market growth potential makes it one of the most exciting countries for game developers to target and a temporary niche. The demand for localization is real. It is actually a priority for gamers in the country. But they don’t want to settle for English, European Portuguese or mediocre translations. Brazilians want to see developers include them in the journey of their games. Big publishers are already picking up on the need to localize for Brazil. This means the time to establish your name among Brazilian gamers is now - before the competition becomes too intense for indie and lesser-known developers. Check our blog for more game localization best practices and tips. Need localization for your game?